Despite the clear link between climate change and human rights with the potential for virtually all protected rights to be undermined as a result of climate change, its catastrophic impact on human beings was not really understood as a human rights issue until recently. 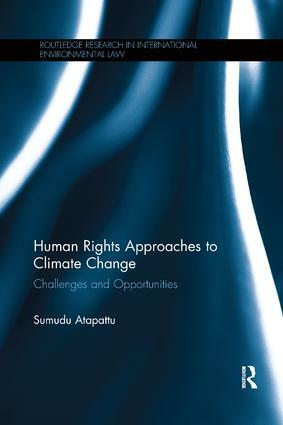 This book examines the link between climate change and human rights in a comprehensive manner. It looks at human rights approaches to climate change, including the jurisprudential bases for human rights and the environment, the theoretical framework governing human rights and the environment, and the different approaches to this including benchmarks. In addition to a discussion of human rights implications of international environmental law principles in the climate change regime, the book explores how the human rights framework can be used in relation to mitigation, adaption, and adjudication. Other chapters examine how vulnerable groups –women, indigenous peoples and climate "refugees" – would be disproportionately affected by climate change. The book then goes on to discuss a new category of people created by climate change, those who will be rendered stateless as a result of states disappearing and displaced by climate change, and whether human rights law can adequately address these emerging issues. Part I: Legal Aspects and Human Rights Framework Chapter 1: International Legal Framework Governing Climate Change: A Human Rights Assessment Chapter 2: Human Rights Approaches to Environmental Protection Chapter 3 – Climate Change and Human Rights: A Justice Issue? Chapter 4: International Environmental Law Principles in the Climate Change Regime: A Human Rights Assessment Chapter 5: Mitigation and Adaptation through a Human Rights Lens Part II – Human Rights and Vulnerable Groups Chapter 6: Climate-related Migration and "Climate Refugees" Chapter 7: Forests, REDD and Indigenous People Chapter 8: Women, Climate Change and Inequality Part III – Human Rights Implications of International Legal Issues Chapter 9: Small Island States and Their People Chapter 10 – Extreme Weather Events, Access to Resources and Conflict: Implications for International Peace and Security Chapter 11 – Using the Human Rights Framework to Adjudicate Climate Change Chapter 12— Climate Change and Human Rights: Square Pegs in Round Holes? Sumudu Atapattu is the Director of Research Centers and Senior Lecturer at the University of Wisconsin Law School, USA and lead counsel for human rights at the Center for International Sustainable Development Law, Montreal, Canada.